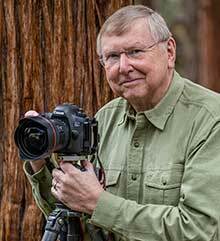 He is also the author of many books, including Golden Poppies of California and Beyond the Basics (I and II): Innovative Techniques for outdoor and Nature Photography. George Lepp will be available for book signings after his keynote address. Harry Fuller has been leading Pacific Coast bird trips for two decades. He frequently teaches bird classes for Point Reyes Field Seminars and other non-profits. He has led trips for Golden Gate Audubon of San Francisco to Malheur and the Oregon Cascades. He frequently leads custom trips in Oregon and Northern California. Harry is the author of Freeway Birding, San Francisco to Seattle for birding Oregon, Washington and Northern California. He also teaches classes in the history of American ornithology. Check out his blog at www.atowhee.wordpress.com and his birding website at http://www.towhee.net/index.html. Bill Smith is a retired Professional Forester who has resided in in Chico since 1975. He has a BS in Forest Management from Michigan Technological University and retired as the �Forest Silviculturist� from the Plumas National Forest in 2010. His forte in the Forest Service was large reforestation project logistics and Service Contract Administration. Notable accomplishments include serving on the Bidwell Park Commission, securing the three acre �Blue Oak Reserve� within Hillview Terrace Subdivision, and spearheadimg the design and build-out of Baroni Park, a Chico Neighborhood Park.